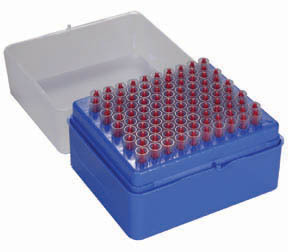 Disposable Red Pipette Tips for the Canine ARS 94.7 ul Positive Displacement Pipette are available in racks of 100 and bulk packaged bags of 200 and 1,000. The Pipette Tip Rack is used as a convenient tool for mating the tip to the Pipette. Racks can be refilled using the Bagged Tips listed below. These tips are used with the ARS 94.7 ul Positive Displacement Pipette shown below.